Green bushes (1921) for full orchestra Percy Grainger 8 mins, 24 sec. Hill-song No. 2 Percy Grainger 4 min, 58 sec. Molly on the shore for orchestra Percy Grainger 3 min, 50 sec. My Robin is to the greenwood gone for full orchestra Percy Grainger 5 mins, 57 sec. Power of love for soprano voice with piano Percy Grainger 3 mins, 32 sec. Power of Rome and the Christian heart Percy Grainger 12 min, 22 sec. Shepherd's hey (1913) for full orchestra Percy Grainger 2 mins, 12 sec. Spoon river — solo piano Percy Grainger 4 mins, 17 sec. To a Nordic princess for orchestra Percy Grainger 13 min, 3 sec. Warriors (1916) for full orchestra Percy Grainger 19 min, 22 sec. This CD is part of a 10 CD box set and is not available separately. Contents note: The warriors -- Green bushes -- Hill-song no. 2 -- Spoon river -- The power of love (from Danish folk-music suite) -- Power of Rome and the Christian heart -- To a Nordic princess: bridal song -- My Robin is to the greenwood gone -- Shepherd's hey -- Molly on the shore. 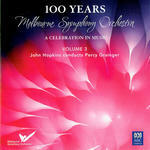 This product forms part of the following series: Melbourne Symphony Orchestra, 100 years (vol. 3). Performers: Melbourne Symphony Orchestra ; John Hopkins (conductor). Score: Shepherd's hey : English Morris dance tune / set for piano by Percy Aldridge Grainger.